I can not believe what a dilemma the choice of trees can be. Cost, beauty, trends and the environment all play a part in the decision. By now, we all know that most fresh cut trees are grown on farms and no one is ravaging forests to sell them to us. If handled properly, a tree, once used goes off to the right part of the dump and ends up being recycled into mulch. Pretty “green” really. And really, what is prettier than a fresh tree? Oh, and the scent! We do live in a desert though and we heat our homes in the winter, so those Northwest grown trees dry out quickly in our climate. To help keep your tree longer, get a fresh cut on the trunk, and keep it watered. There are products in nurseries that can be sprayed on evergreens to lock in moisture. Wilt Pruf works well. The dreamy alternative to this, of course, is to cut your own tree. Make an adventure of this experience with a picnic and a day in the woods. Don’t forget the permit though. Check out the forest service website for info. I love the idea of a live tree, and for years it was the answer for our family. Though the time you can enjoy it indoors is limited (you don’t want your tree to think Spring has arrived). You can be very creative. Decorate in stages. Put the lights on while it is still outdoors and display it that way for a few weeks. Then haul it in (no more than a week) before Christmas, and add the ornaments. If you plan ahead, the hole where it will be planted is dug in the autumn. The tree can go right into it and keeping it damp, is not a wintertime issue. How fun for the kids to have their trees grow up with them! One year my youngest picked a funky Blue Atlas Spruce. It has grown into a wonderful contorted ornamental that graces the garden. Noles Nursery on 6400 South has great home grown stock. If you wander in and don’t see someone right away, Nolan’s number is 801-505-1753. He’s the old duffer who owns the place and he’ll take care of you. 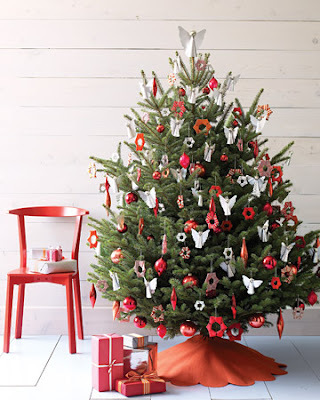 The fake tree, or call it faux if it makes you feel better, has a lot going for it. Pre-lit and paying for itself over time are some of the best characteristics. But don’t be fooled into thinking they are the “green” choice. It takes about a gazillion years for the poly stuff they are made out of to biodegrade in the landfill. You can have them up forever, and they are always a perfect shape. Convenience is no small thing, and for all these reasons, they seem to be the tree of choice. Price varies according to quality and the range is huge. Don’t pay full price, every craft store in town has a weekly coupon in the paper. The choice is no small thing, but there is nothing like the magic a Christmas Tree brings to a home.